This web site has been created as part of the "Project for the Preservation and Utilization of Artifacts from Nonaka Kofun ‘ Fiscal 2011 project 'Tourism Promotion and Local Revitalization by Utilizing the Advantage of Cultural Heritage' (funded by a budget appropriated for the project to exhibit and utilize historic sites and buried cultural properties)." Among the kofun of the Mozu-Furuichi Tomb Clusters, which were inscribed in fiscal 2010 on the Tentative List of the World Heritage Sites, Nonaka Kofun holds a special importance as one of the few tombs whose grave goods have been made known. In 1964, the Osaka University School of Letters conducted excavations of the site. Many of the iron weapons, tools, and armor that were discovered, however, were not adequately preserved, rendering their utilization as cultural properties difficult. 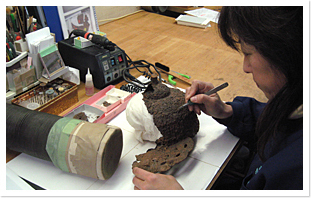 This project thus aims to preserve and utilize the artifacts excavated from Nonaka Kofun, thereby arousing public interest in the Mozu-Furuichi Tomb Clusters and promoting a better understanding of their historical significance.